United States visas are documents that give you permission to travel to the U.S. They are given to you by a U.S. consular officer from the country you’re leaving. There are two categories of visas, immigrant and non-immigrant. The purpose of an immigrant visa is to apply for Permanent Resident Status. A Permanent Resident is allowed to live and work in the U.S. indefinitely. It is also the first step to becoming a U.S. citizen. 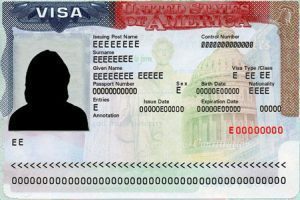 A non-immigrant visa is for coming to the U.S. for a specific amount of time. For example, to visit the U.S. on vacation (holiday), work temporarily, to meet with a client, or to attend university. Read more about non-immigrant visas here. The immigration visa process can be confusing. There’s a lot to know, so it’s easy to misunderstand or forget something. That’s why we are here to help. We know the immigration process and will tell you what to do and when to do it. You must find a sponsor to complete a petition. A relative who is a U.S. citizen, like a parent, spouse, sibling, or a child can sponsor you. A spouse or parent who is a Permanent Resident can also sponsor. A potential employer can also sponsor you. The sponsor completes the petition and turns it in to U.S. Citizenship and Immigration Services (USCIS). If the petition is approved, you are given an immigrant visa and allowed to travel to the U.S.
Next, you must apply to be a Permanent Resident. Sometimes you can apply to be a Permanent Resident before moving to the U.S. We will tell you if you can do that. You must complete the application process. Sometimes this involves a medical exam or an interview. We will help you prepare. If your application is approved, a Permanent Resident card (“green card”) is mailed to you at your new U.S. address, or you get it at the local immigration office. This depends on if you applied before moving to the U.S. or after moving to the U.S. If you want help getting an immigrant visa, or have questions about the process, contact us. We will make the process easier and less stressful. You can call us at 813-298-7222, or email us by clicking here, or schedule an appointment by clicking here.